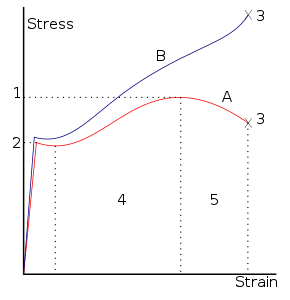 figure 2: "Engineering" (red) and "true" (blue) stress–strain curve typical of structural steel. Many materials can display linear elastic behavior, defined by a linear stress–strain relationship, as shown in figure 1 up to point 3. The elastic behavior of materials often extends into a non-linear region, represented in figure 1 by point 2 (the "yield point"), up to which deformations are completely recoverable upon removal of the load; that is, a specimen loaded elastically in tension will elongate, but will return to its original shape and size when unloaded. Beyond this elastic region, for ductile materials, such as steel, deformations are plastic. A plastically deformed specimen does not completely return to its original size and shape when unloaded. For many applications, plastic deformation is unacceptable, and is used as the design limitation. After the yield point, ductile metals undergo a period of strain hardening, in which the stress increases again with increasing strain, and they begin to neck, as the cross-sectional area of the specimen decreases due to plastic flow. In a sufficiently ductile material, when necking becomes substantial, it causes a reversal of the engineering stress–strain curve (curve A, figure 2); this is because the engineering stress is calculated assuming the original cross-sectional area before necking. The reversal point is the maximum stress on the engineering stress–strain curve, and the engineering stress coordinate of this point is the ultimate tensile strength, given by point 1. UTS is not used in the design of ductile static members because design practices dictate the use of the yield stress. It is, however, used for quality control, because of the ease of testing. It is also used to roughly determine material types for unknown samples. The UTS is a common engineering parameter to design members made of brittle material because such materials have no yield point. Typically, the testing involves taking a small sample with a fixed cross-sectional area, and then pulling it with a tensometer at a constant strain (change in gauge length divided by initial gauge length) rate until the sample breaks. 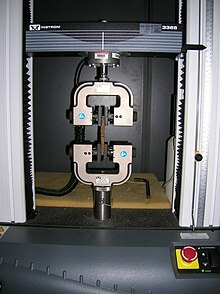 When testing some metals, indentation hardness correlates linearly with tensile strength. This important relation permits economically important nondestructive testing of bulk metal deliveries with lightweight, even portable equipment, such as hand-held Rockwell hardness testers. This practical correlation helps quality assurance in metalworking industries to extend well beyond the laboratory and universal testing machines. ^a Many of the values depend on manufacturing process and purity or composition. ^b Multiwalled carbon nanotubes have the highest tensile strength of any material yet measured, with labs producing them at a tensile strength of 63 GPa, still well below their theoretical limit of 300 GPa. The first nanotube ropes (20 mm in length) whose tensile strength was published (in 2000) had a strength of 3.6 GPa. The density depends on the manufacturing method, and the lowest value is 0.037 or 0.55 (solid). ^c The strength of spider silk is highly variable. It depends on many factors including kind of silk (Every spider can produce several for sundry purposes. ), species, age of silk, temperature, humidity, swiftness at which stress is applied during testing, length stress is applied, and way the silk is gathered (forced silking or natural spinning). The value shown in the table, 1000 MPa, is roughly representative of the results from a few studies involving several different species of spider however specific results varied greatly. ^d Human hair strength varies by ethnicity and chemical treatments. ^ "Generic MMPDS Mechanical Properties Table". stressebook.com. 6 December 2014. Archived from the original on 1 December 2017. Retrieved 27 April 2018. ^ a b "Tensile Properties". Archived from the original on 16 February 2014. Retrieved 20 February 2015. ^ "ASTM A36 Grade Shape structural shape Steel - Matmatch". matmatch.com. Retrieved 8 June 2018. ^ "MatWeb – The Online Materials Information Resource". Archived from the original on 15 December 2013. Retrieved 20 February 2015. ^ "MatWeb – The Online Materials Information Resource". Archived from the original on 21 February 2015. Retrieved 20 February 2015. ^ "MatWeb – The Online Materials Information Resource". Archived from the original on 28 March 2017. Retrieved 20 February 2015. ^ "USStubular.com". Archived from the original on 13 July 2009. Retrieved 27 June 2009. ^ strictly speaking this figure is the flexural strength (or modulus of rupture), which is a more appropriate measure for brittle materials than "ultimate strength." ^ a b "Guide to Glass Reinforced Plastic (fibreglass) – East Coast Fibreglass Supplies". Archived from the original on 16 February 2015. Retrieved 20 February 2015. ^ "Properties of Carbon Fiber Tubes". Archived from the original on 24 February 2015. Retrieved 20 February 2015. ^ "6061-T6 Aluminium Wrought Aluminium - Matmatch". matmatch.com. Retrieved 8 June 2018. ^ "OS050 C11000 Copper Wrought Copper - Matmatch". matmatch.com. Retrieved 8 June 2018. ^ "Soda-Lime (Float) Glass Material Properties :: MakeItFrom.com". Archived from the original on 3 July 2011. Retrieved 20 February 2015. ^ "Basalt Continuous Fibers". Archived from the original on 29 December 2009. Retrieved 29 December 2009. ^ "Toray Properties Document". Retrieved 17 September 2018. ^ "Tensile Testing Hair". instron.us. Archived from the original on 28 September 2017. ^ Agnarsson, I; Kuntner, M; Blackledge, TA (2010). "Bioprospecting Finds the Toughest Biological Material: Extraordinary Silk from a Giant Riverine Orb Spider". PLoS ONE. 5 (9): e11234. Bibcode:2010PLoSO...511234A. doi:10.1371/journal.pone.0011234. PMC 2939878. PMID 20856804. ^ Oral, E; Christensen, SD; Malhi, AS; Wannomae, KK; Muratoglu, OK (2006). "PubMed Central, Table 3". J Arthroplasty. 21 (4): 580–91. doi:10.1016/j.arth.2005.07.009. PMC 2716092. PMID 16781413. ^ "Tensile and creep properties of ultra high molecular weight PE fibres" (PDF). Archived from the original (PDF) on 28 June 2007. Retrieved 11 May 2007. ^ "Mechanical Properties Data". www.mse.mtu.edu. Archived from the original on 3 May 2007. ^ "Nylon Fibers". University of Tennessee. Archived from the original on 19 April 2015. Retrieved 25 April 2015. ^ "Comparing aramids". Teijin Aramid. Archived from the original on 3 May 2015. ^ "Uhu endfest 300 epoxy: Strength over setting temperature". Archived from the original on 19 July 2011. ^ "Fols.org" (PDF). Archived (PDF) from the original on 25 July 2011. ^ "What is the density of Hydrogenated Boron Nitride Nanotubes (H-BNNT)?". space.stackexchange.com. Archived from the original on 13 April 2017. ^ Lee, C.; et al. (2008). "Measurement of the Elastic Properties and Intrinsic Strength of Monolayer Graphene". Science. 321 (5887): 385–8. Bibcode:2008Sci...321..385L. doi:10.1126/science.1157996. PMID 18635798. Archived from the original on 19 February 2009. Lay summary. ^ IOP.org Z. Wang, P. Ciselli and T. Peijs, Nanotechnology 18, 455709, 2007. ^ Xu, Wei; Chen, Yun; Zhan, Hang; Nong Wang, Jian (2016). "High-Strength Carbon Nanotube Film from Improving Alignment and Densification". Nano Letters. 16 (2): 946–952. Bibcode:2016NanoL..16..946X. doi:10.1021/acs.nanolett.5b03863. PMID 26757031. ^ Barber, A. H.; Lu, D.; Pugno, N. M. (2015). "Extreme strength observed in limpet teeth". Journal of the Royal Society Interface. 12 (105): 105. doi:10.1098/rsif.2014.1326. PMC 4387522. ^ Yu, Min-Feng; Lourie, O; Dyer, MJ; Moloni, K; Kelly, TF; Ruoff, RS (2000). "Strength and Breaking Mechanism of Multiwalled Carbon Nanotubes Under Tensile Load". Science. 287 (5453): 637–640. Bibcode:2000Sci...287..637Y. doi:10.1126/science.287.5453.637. PMID 10649994. ^ Li, F.; Cheng, H. M.; Bai, S.; Su, G.; Dresselhaus, M. S. (2000). "Tensile strength of single-walled carbon nanotubes directly measured from their macroscopic ropes". Applied Physics Letters. 77 (20): 3161. Bibcode:2000ApPhL..77.3161L. doi:10.1063/1.1324984. Archived from the original on 14 May 2016. ^ K.Hata. "From Highly Efficient Impurity-Free CNT Synthesis to DWNT forests, CNTsolids and Super-Capacitors" (PDF). Archived (PDF) from the original on 12 June 2010. ^ Elices; et al. "Finding Inspiration in Argiope Trifasciata Spider Silk Fibers". JOM. Archived from the original on 15 January 2009. Retrieved 23 January 2009. ^ Blackledge; et al. "Quasistatic and continuous dynamic characterization of the mechanical properties of silk from the cobweb of the black widow spider Latrodectus hesperus". The Company of Biologists. Archived from the original on 1 February 2009. Retrieved 23 January 2009. Giancoli, Douglas, Physics for Scientists & Engineers Third Edition (2000). Upper Saddle River: Prentice Hall. Köhler T, Vollrath F (1995). "Thread biomechanics in the two orb-weaving spiders Araneus diadematus (Araneae, Araneidae) and Uloboris walckenaerius (Araneae, Uloboridae)". Journal of Experimental Zoology. 271: 1–17. doi:10.1002/jez.1402710102. Min-Feng Y, Lourie O, Dyer MJ, Moloni K, Kelly TF, Ruoff RS (2000). "Strength and Breaking Mechanism of Multiwalled Carbon Nanotubes Under Tensile Load". Science. 287 (5453): 637–640. Bibcode:2000Sci...287..637Y. doi:10.1126/science.287.5453.637. PMID 10649994.